Habit: Annual < 1.5 m. Stem: prostrate to erect, glabrous, often glaucous, or puberulent (hairs long, spreading). Leaf: pinnately veined; petiole < 4 cm or 0; blade 1--10 cm, linear to elliptic or ovate, entire or shallow-toothed, glabrous or sparsely puberulent. Inflorescence: spike, raceme; bracts leaf-like; axis in bud straight or recurved at tip, in flower +- straight; buds erect or not. Flower: hypanthium obconic to cup-shaped, or long, slender, generally with ring of hairs within; sepals 4, generally fused to tip in bud, reflexed at least at base, staying fused at least at tip, in 4s or 2s, or all coming free; corolla bowl-shaped to rotate, petals 5--60 mm, often lobed or clawed, lavender or pink to dark red, pale yellow, or white, often spotted, flecked, or streaked with red, purple, or white; stamens 8, in 2 like or unlike series, or 4, filaments cylindric to wider distally, subtended by ciliate scales or generally not, anthers attached at base, pollen white or yellow to blue-gray, lavender, or +- red; ovary 4-chambered, glabrous or not, cylindric, fusiform, or wider distally, generally shallowly to deeply 4- or 8-grooved, stigma lobes 4, generally prominent. Fruit: generally capsule, elongate (short, indehiscent, nut-like). Seed: generally many, rarely 1--2, 0.5--2 mm, angled, crested or not, brown, gray, or mottled. Species In Genus: +- 41 species: western North America, 1 South America. Etymology: (Captain William Clark, 1770--1838, of Lewis & Clark Expedition) Note: Self-fertile; self-pollinated or outcrossed; on herbarium specimens, curvature of inflorescence axis in bud generally reliable, pollen color generally not. Stem: decumbent to erect, < 1 m, glabrous, to densely puberulent (some hairs longer), glaucous or not. Leaf: petiole 0--2 mm; blade 1.5--7 cm, linear or narrowly oblanceolate to elliptic or ovate. Inflorescence: axis in bud straight; buds erect. Flower: hypanthium 2--10 mm, not conspicuously veined; sepals staying fused in 2s or all coming free; corolla bowl-shaped, petals fan-shaped, obovate or elliptic, lavender or pale pink to purple or dark wine-red, often with red or purple spot near middle or proximally or distally; stamens 8, anthers alike; ovary 8-grooved, length < 8 × width. Fruit: 1--3 cm; beak 0--2 mm. Chromosomes: n=26. Note: Subspecies intergrade extensively. Other subspecies to Washington, Arizona, Baja California. Leaf: 1.5--4.5 cm, broadly lanceolate to elliptic or ovate, glabrous to sparsely puberulent. Inflorescence: dense. Flower: petals 10--25 mm, lavender to purple or purple-red, often lighter proximally, often with a darker spot distally; stigma exserted beyond anthers; ovary > distal internode. 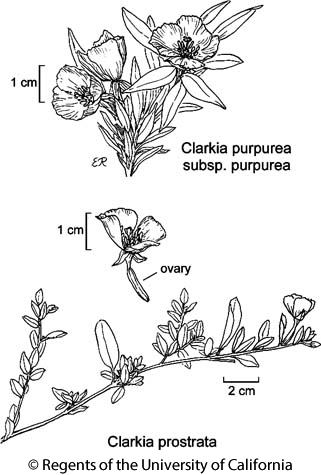 Citation for this treatment: Harlan Lewis 2012, Clarkia purpurea subsp. purpurea, in Jepson Flora Project (eds.) Jepson eFlora, http://ucjeps.berkeley.edu/eflora/eflora_display.php?tid=49906, accessed on April 24, 2019. GV, CCo; Markers link to CCH specimen records. Yellow markers indicate records that may provide evidence for eFlora range revision or may have georeferencing or identification issues. Purple markers indicate specimens collected from a garden, greenhouse, or other non-wild location.